Choose your favorite player and play to become the best. 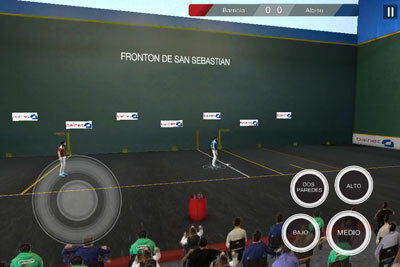 Download now the new version of the Fronton videogame at App Store and Google Play. You can watch all the pictures of the pressconference of the Fronton videogame in our Facebook: https://www.facebook.com/JuegoFronton. The next February we will show the Fronton videogame to the media. The press conference, that will be in Bilbao, includes the managers of Bainet, the developers Pulsar Concept and Joseba Beloki, ex-handball player and consultant of the videogame. The conference will be show by Josetxo Litzartza, tv-presenter of the Fronton program. Watch the video about how we made the Fronton video game. Watch video: Vídeo making off.